WASHINGTON — Starting today, the FINRA Investor Education Foundation Military Spouse Fellowship is accepting applications for its 2018 class of financial Fellows — a unique program designed to increase the financial capability of U.S. service members and their families. The national program offers military spouses the opportunity to earn a career-enhancing credential — the AFC® (Accredited Financial Counselor®) — while providing financial counseling and education to the military community. Applications must be received no later than midnight, EDT, April 20, 2018. The program is open to current or surviving spouses of active duty or retired Army, Navy, Air Force, Marine Corps, Coast Guard, National Guard or Reserve service members, as well as spouses of members of the U.S. Public Health Service Commissioned Corps and the National Oceanic and Atmospheric Administration Commissioned Officer Corps. Prospective candidates can apply online at http://www.afcpe.org/resource-center/funding-and-recognition/finra-foundation-military-spouse-fellowship. The FINRA Foundation has provided more than 1,480 military spouses the opportunity to earn the AFC® designation. In turn, Fellows serve the military community of which they are a part. Active Fellows provided financial counseling and education to over 18,000 service members or their spouses in 2017 alone, and have spent more than 454,000 hours helping military families reach their financial goals since the program’s inception in 2006. Upon completion of the AFC® certification, Fellows continue to support the military community as financial counselors at family readiness and support centers, credit counseling and tax centers, financial aid offices, and credit unions throughout the U.S. and abroad. These organizations need well-trained specialists who understand the unique financial needs of military families. There are approximately 1.3 million active-duty military and more than 800,000 reserve forces, according to the Department of Defense. In addition, there are approximately 22 million military U.S. veterans in America, representing more than 8 percent of the U.S. population. According to a 2015 FINRA Foundation study of the financial health of American veterans relative to non-veterans, researchers found that veterans are faring better financially, as a whole, than their civilian counterparts. However, veterans are 40 percent more likely to be underwater on their home and 28 percent more likely to have made a late home payment in the past year. In addition, veterans are 9 percent more likely to engage in problematic credit card behavior, such as carrying a balance and being charged a late payment fee. The Fellowship is provided by the FINRA Investor Education Foundation, in partnership with the Association for Financial Counseling and Planning Education® (AFCPE®), which administers the certification, and the National Military Family Association (NMFA), which assists with the selection process. The FINRA Foundation covers the costs associated with the program’s self-study course and exam. 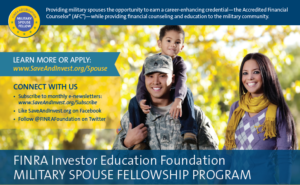 Full biographies of selected accredited spouse fellows are available at www.SaveAndInvest.org/Military. The FINRA Investor Education Foundation supports innovative research and educational projects that empower underserved Americans with the knowledge, skills and tools to make sound financial decisions throughout life. Since 2006, the Foundation has delivered free, unbiased financial education tools and training to service members, their spouses and military financial educators through on-base educational forums, professional development training programs and online and printed educational resources. A collaborator in the U.S. Department of Defense Financial Readiness Campaign, the primary goal of the Foundation’s Military Financial Readiness Project is to help military families manage their money with confidence. Learn more at www.SaveAndInvest.org/Military. Association for Financial Counseling and Planning Education® (AFCPE®) certifies, trains, and supports financial professionals to be qualified motivators of change for people with life goals, regardless of where they are or where they’ve been on their financial journey. Our comprehensive certification programs represent the highest standard for financial counseling, coaching and education, including the AFC®(Accredited Financial Counselor®) and FFC® (Financial Fitness Coach) certifications. The AFC® certification is accredited by NCCA and nationally recognized by the CFPB and DoD. AFCPE membership is made up of a diverse and inclusive community representing professionals from across the financial continuum. AFCPE offers a strong professional network, as well as access to tools and resources that advance your work and enhance your career. To learn more visit, www.afcpe.org. The National Military Family Association is the leading non-profit dedicated to serving the families who stand behind the uniform. Since 1969, NMFA has worked to strengthen and protect millions of families through its advocacy and programs. They provide spouse scholarships, camps for military kids, and retreats for families reconnecting after deployment and for the families of the wounded, ill, or injured. NMFA serves the families of the currently serving, retired, wounded or fallen members of the Army, Navy, Marine Corps, Air Force, Coast Guard, and Commissioned Corps of the USPHS and NOAA. To get involved or to learn more, visit www.MilitaryFamily.org.